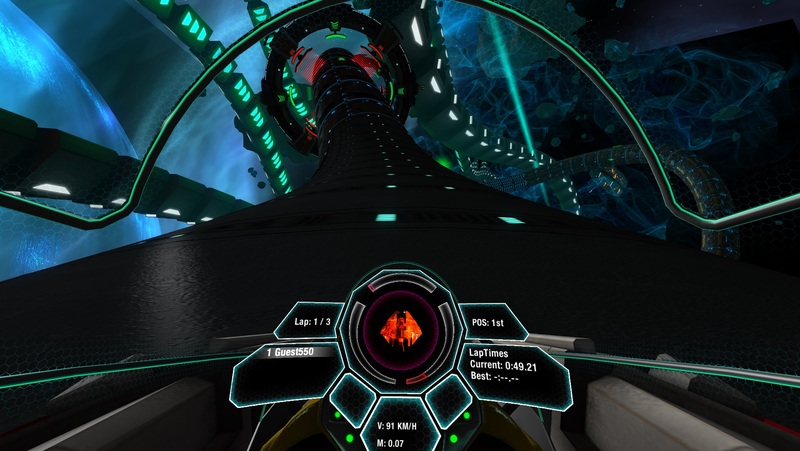 Tammeka games, the UK based creators of “high-octane multi-player sci-fi racer” Radial-G, have made it to Steam via the Greenlight program. To celebrate, the team have released an ‘early access’ demo which includes new tracks and ships. 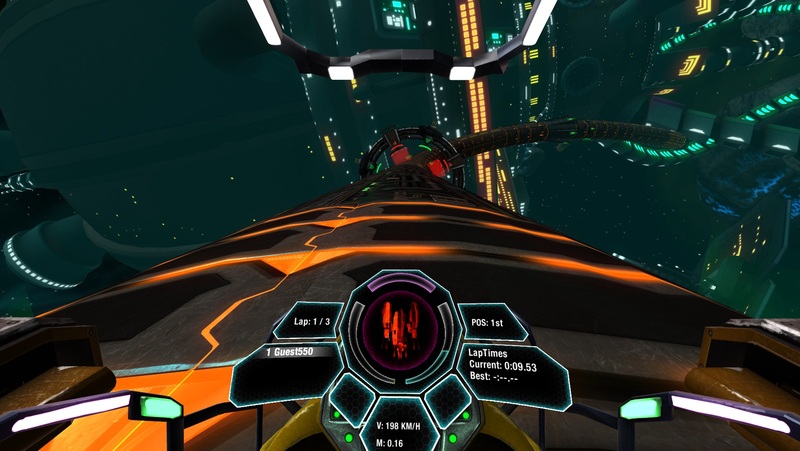 We take it for a spin in VR. 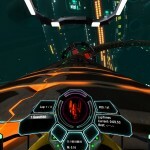 It’s been a tumultuous year for Tammeka Games, the developers responsible for pushing old-school sci-fi racing into the virtual reality realm with their first title Radial-G. In that time, the game’s built up quite a following in the VR community from those who appreciate the developer’s devotion to the genre. The speed at which Radial-G has evolved is a testament to that devotion. But whilst this evolution manifests in some very pretty and astonishingly slick visuals, it’s the riotous gameplay that keeps people coming back for more. It’s just bloody good fun! 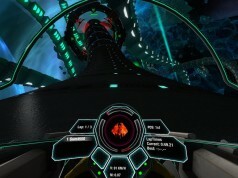 Climbing into the virtual cockpit of the early access steam demo, available now to anyone who purchases the game, I was pleasantly surprised at how easy it was to just get on with the damned racing already. 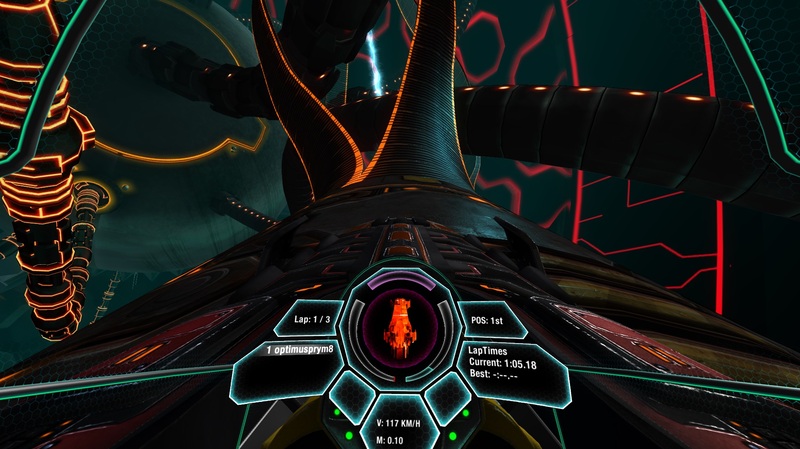 The game can be launched in ‘direct to Rift’ mode for one, meaning that upon starting Radial-G, it’ll detect any Oculus Rift headset you have attached and render directly to it—easy! 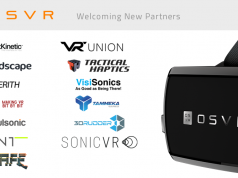 Once ‘inside’ the game, another pleasant surprise—VR friendly menus are evident throughout. 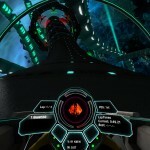 This is an aspect of VR gaming that will (I hope) be consigned to the history books soon enough, but previous versions of Radial-G presented only a 2D, non-VR starting menu. This meant that just getting in to play the game was an exercise in guesswork, button jabbing and copious swearing until you found the ‘launch’ button. That’s all in the past now as navigation through the new options are rendered in 3D space, meaning you can glance about, around, and into them as you’re guided into the game. 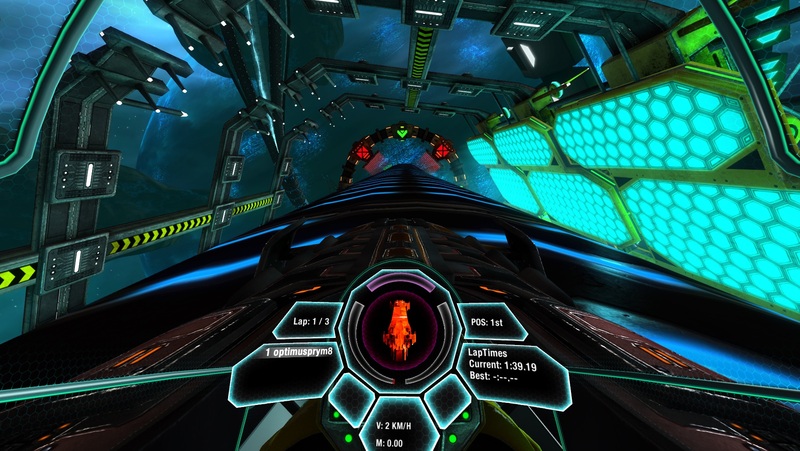 You can now easily choose between three ships and three tracks, two of which are new for this demo. Three game modes are in evidence too, although only one ‘lap attack’ is currently select-able in this version. Update: The latest build of Radial-G does now have multiple modes: Normal, No Gates, Elimination, and Death Race – which includes AI controlled opponents. 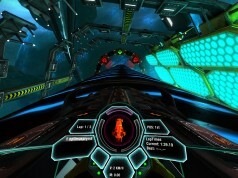 Once inside the cockpit, Radial-G‘s technical chops become evident. Rendered in faultless low-persistence, your Oculus Rift DK2 viewport becomes a window into another world. As I glanced down at my avatar’s legs, then up at the vast alien world, the sense of place was remarkable. 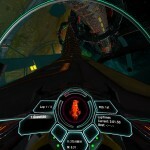 It struck me that even games designed to be picked up and played quickly, can offer this new dimension of immersion, in fact it may become the standard for VR titles. The gameplay is fast, taut, and tortuous at times. I lost count of the occasions I veered off a skyway as I gazed slack-jawed at a distant landmark. You can keep your 1000 unlockable ship configurations and DLC’d ‘custom vehicle livery’—just give me a great view to enjoy as I play and I’m more than happy. 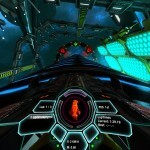 Playing Radial-G is a curious mix of vertigo and tranquility. Whilst the vertiginous drops and spiraling speed should in theory cause instant nausea whilst in VR, thanks to the excellent frame rate and fixed seating position it absolutely does not. That’s not to say Radial-G isn’t exciting, now that things have been spiced up thanks to the addition of ramps and raceway splits, keeping on the ‘track’ requires concentration. But in truth, it’s the search for speed that represents Radial-G‘s core gameplay right now. 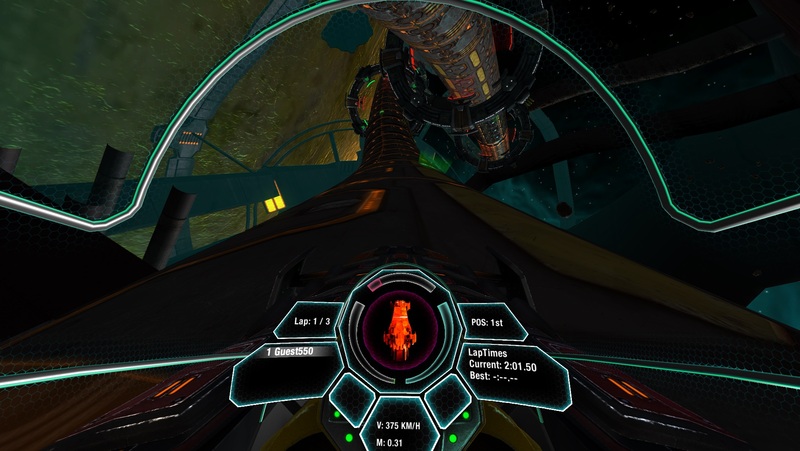 As you learn the tracks, you become adept at picking your racing line to hit the optimal number of speed strips and trimming your lap times. It’s a satisfying mechanic that’s rewarding even without any fellow racers with which to jostle position. The ship’s inertia also means navigating your craft is pleasingly predictable, if at times a little twitchy (at least using an Xbox 360 gamepad). My only criticism, given the fact that you race alone right now, is that the gameplay can at times feel a little ‘on rails’. As I said, the ramps and track splits certainly go some way to addressing these concerns, but it’d be great if the team could capture some of the challenge in both the F-Zero and Wipeout series of games, where on later stages you had to know the track backwards in order to survive. That aside, I can’t wait to step into the cockpit alongside several friends and battle for supremacy. I can see aggressive maneuvers to send your opponents spinning off the track being enormous fun in multi-player, once it’s implemented. 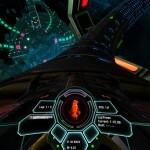 So, Radial-G continues to impress both at an artistic, technical and playable level. 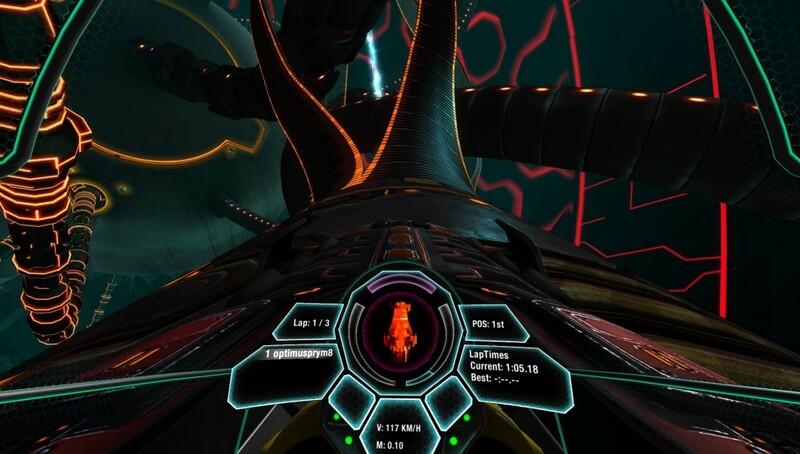 What’s more, it’s evolving quickly from a barren if impressive technical demo into a bonafide arcade racer that fans of the genre can really sink their teeth into. Given this is the first early access demo to be released, we can’t wait to see where the game is in a few months time. 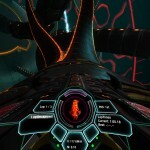 Radial-G is available via Steam instant access here. 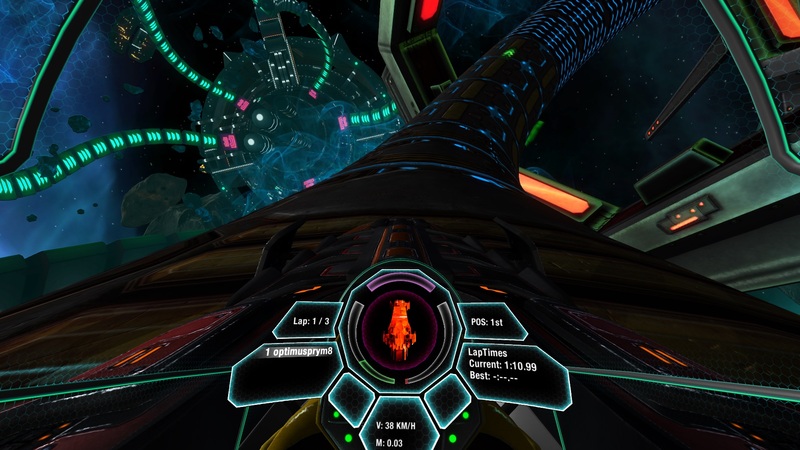 You can follow Radial-G‘s progress via Tammeka’s website or the game’s dedicated twitter feed.